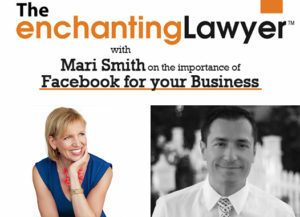 The ‘Queen of Facebook’, Mari Smith is one of the world leaders in social media and facebook marketing. The fact that Facebook have recently chosen her to lead their “Boost your Business” event is testament to the fact that what she doesn’t know about using Facebook for business isn’t worth knowing. Mari travels the world teaching people and companies how to form great relationships and business success through social media. In today’s show, Mari chats to Jacob about why Facebook is her chosen social media platform, how she stays up to date with Facebook’s changes and how she believes that Facebook will become the number one customer services tool. Facebook and social media are tools that businesses can no longer ignore. 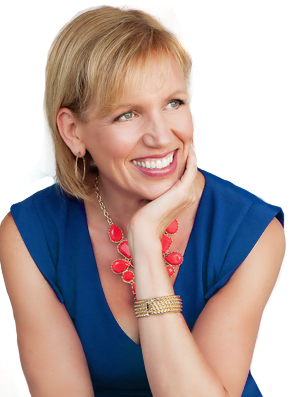 Mari Smith knows this only too well as she sees their power for businesses day in, day out. 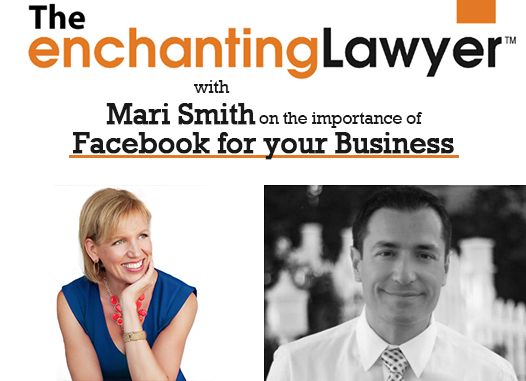 Mari Smith is one of the world’s leading Facebook and social media experts and in today’s show she talks to Jacob about the power of Facebook, getting the right content out there and using Facebook for customer services. Jacob: Hello everybody, this is Jacob Sapochnick, host of the Enchanting Lawyer Podcast. Welcome to the show. We had a very amazing guests in the past four weeks, but today I have a special guest, somebody who’s special to me in my heart. A person I met several years ago and became friends, and I learned a lot from her. Our guest today is Mari Smith. For those of you who know Mari, Mari is one of the world’s leading social media strategists and widely recognize as a top Facebook marketing expert in the world. She’s author of The New Relationship Marketing and co-author of Facebook Marketing: An Hour A Day. Fast Company describes Mari as a veritable engine of personal branding, a relationship marketing whiz, and a Pied Piper of the online world. Forbes named Mari as one of the top 10 social media influencers in the world. Recently, Facebook has chosen Mari to lead the Boost Your Business event which is a series of live events throughout the country and Mari is taking small businesses and showing how Facebook is helping them grow their businesses, which is amazing. Mari, welcome to the show. I’m super excited to have you today. Mari: Well, thank you, thank you, Jacob. This is wonderful to be on your show. It’s been a real joy to watch your rise to fame and fortune, so to speak, and this podcast is one of them. I really admired how you’ve taken this on. I plan to launch my own podcast someday but it’s a joy to be on the show with you today. Jacob: Thank you. It’s one of those things where you can … we talk before there’s so many platforms out there, but I think a podcast is an opportunity for the host and the guest to have a one-on-one conversation and people can listen to it in their own time and just take whatever they can from this conversation. I’m sure we’re going to have a lot of value to share today. Jacob: Mari, I introduced you a little bit, and I’m sure … most of my listeners are professionals, attorneys, and non-attorneys, and people that enjoy learning about social and how they can build businesses kind of like how I’ve done it. But I want to, perhaps in your own words, share how you came to this country. Again, we share the immigrant story together. Just tell us a little bit where you come from, why did you come to the US, and how you get started on social media. Mari: Okay, great. Yes, absolutely. I just love that you have that new book My American Job, My American Dream Job. It’s so amazing because, gosh. Having been born in Canada to Scottish parents, and then when I was 12 my parents divorced, my dad got (audio breaks) just amazing, cross the Atlantic in a big old boat. Took us 9 days, I’ll never forget. I was 12 years. And then I was in the UK for the next 20 years.